Welcome to the Purchase Fire Department Guestbook. Your feedback is important to us. Feel free to leave your comments. A great big hello to PFD from Kansas! Great website, would love to see more historical photos! It brings back memories of many a weekend spent climbing on the trucks as a kid. Hello, my name is Tibor and I am a firefighter from Slovakia. Your web page is very nice and interesting. I wish you a lot of success in your future work. Greetings from Slovakia. Guest Name: George Maier aka "Gonzo"
Just a hello from a former member back in the early 80's. Glad to see the house is still strong. A hello to all who remember me (the older farts!). Btw..I need a chili cheesesteak wedge from the Cobblestone and a bacon/egg/cheese on a hard roll from the Deli! UN GROSSO SALUTO A TUTTI VOI, GRAZIE PER QUELLO CHE FATE PER LA COMUNITA'. Guys, your website looks great, lots of good times at PFD. THANK YOU FOR YOUR SERVICE AND ALL YOU GIVE EVERY DAY. Just wanted to thank everyone at the Purchase Fire Dept. for the work they have done for this community. It is not only admirable but a great service and sacrifice for someone to take the time out of their schedule from family and business for the benefit of a community. Thank you again and keep up the outstanding service you provide. Thanks for coming to the inspection tonight! What a great web site. You all should be very proud of what you have done. I can see that the Purchase Fire Department is as great an organization as it was when I lived on Purchase Street. You make everyone miss living there. God bless you all and keep up the great work you all do. Guest Name: John J Portanova Jr. The website looks great. It was nice to see a picture of the department from back in the 1940's when my father was chief in the history section. I was a member from 1970-1975. Things sure have changed. The amount of calls annually you have to deal with for that size department is hard to imagine compared to the amount of calls we got when I was a member. I'm glad to see the pride you guys take in the department has not changed over the years. Keep up the good work. Even though I haven't lived there in over 30 years, Purchase is always in my heart. 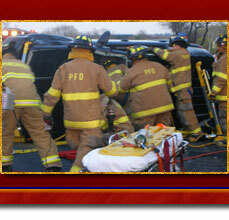 How cool to have stumbled onto the PFD web site. Looks great! Love the pictures, makes me want to head back up north for a bit. Hope all is well back in the Motherland. Rank/Title: Lieutenant, Poningoe Hook & Ladder Co.
Nice to see TL-53 in action the other night! This site looks great, too. Keep up the good work, and thanks for the photo credits. Hey Guys....great job on the website! I cant believe that 238 was retired/replaced. I can remember the 1st run that engine made way back when. I did get to see Ladder 53, and E-240 when I was home a few years ago....nice!! :-) As John Mellardo said....it really makes me homesick! Keep up the good work, and keep updating the pictures....Glad to see some familiar faces!! Congratulations on your new website. This gives greater exposure to all the fine, often overlooked work you do for your community. Many thanks to all my friends at the House for all your exemplary sacrifices, some of which have been greater than others. Great job with the site!! My compliments to your department, look forward to our endeavors within the Sound Shore. Good luck with the new engine and see you at the Nike base!! Nice job on the web site, keep it up. On behalf of myself, officers and members of the West Harrison Fire Department we want to wish all your members and families a Happy and Prosperous New Year. As always we look forward to working with you in 2008. As a member of the local community I would just like to say that you all are the real unsung heros, devoting your time and expertise to keep us safe - God bless! KEEP UP THE GOOD WORK,.AND PLEASE KEEP SUPPORTING US TROOPS,.GOD BLESS,. "HOOAH" CAN I HAVE A PATCH? To My Friends in Purchase-Great web site!! Keep up the good work! HAPPY HOLIDAYS!!! I would like to thank all of those who helped make this web site come to fruition. I know that countless hours were spent working on it and it is greatly appreciated. This is a historical moment in Purchase Fire Department history, and you are a part of that history. Be proud ! The site looks great guys! Makes me homesick. Keep up the good work. Nice site, and you have some beautiful equipment. Stay safe! Best of luck with your new site, it looks great! Again i'm proud to be the first one to sign your guestbook, i am a big fan of Firehouse Solutions.